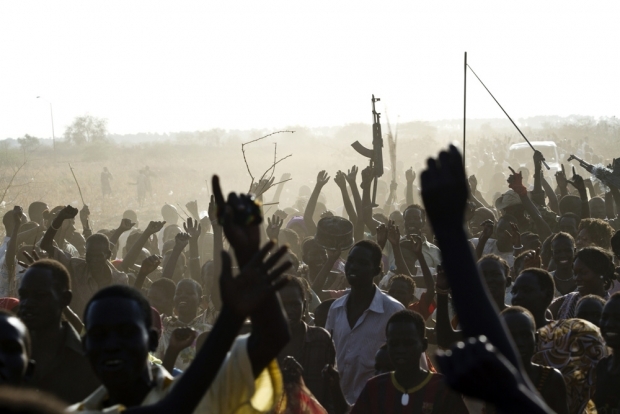 A Sudan People’s Liberation Army soldier waves his AK-47 as soldiers and internally displaced people celebrate outside the United Nations Mission in the Republic of South Sudan base in Malakal after the army claimed it had recaptured the town from rebels on March 19, 2014. In June, China’s ambassador to Juba, Ma Qiang, publicly declared that Beijing would not sell weapons to any side of the ongoing civil conflict in South Sudan. So it was a bit of a surprise when it was discovered that $38 million of weapons had been sold by the Chinese state-owned weapons company Norinco to the South Sudanese government. Now, in September, the Chinese government has cancelled that contract and says it is living up to its original promise to embargo all arms sales.